This online EMT transition course is state approved and accepted by the NREMT. All NREMT-Basics have two registration cycles (four years) to complete a state approved Emergency Medical Technician-Basic (EMT-B) to Emergency Medical Technician (EMT) transition course in order to be eligible for National EMS Certification as an Emergency Medical Technician. This Online EMT Transition Course is a self directed, interactive, blended learning course that is designed to bridge the gap in knowledge between EMT's trained under the U.S. DOT 1994 National Standard Curriculum and the new National EMS Educational Guidelines. The course curriculum covers all new Emergency Medical Technician knowledge and skill requirements that are listed in the National EMS Educational Standards. Students must complete all chapter modules which include quizzes built into each module. After successful completion of a chapter module students will be issued a verification code that will allow entry into the Learning Management System for verification. Students may complete the modules on a computer, smart phone, or tablet device (apple and android devices have been tested to verify they work). If you are a self motivated student who needs to take a state approved EMT transition course, This course will work for you. 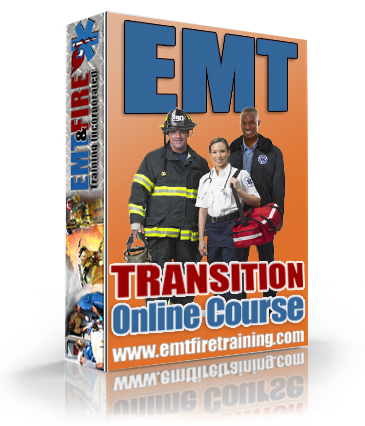 - Online EMT Transition Class and eTextbook. 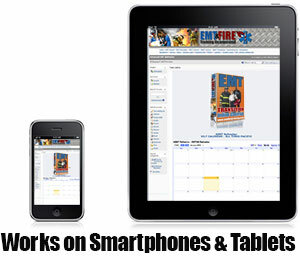 - 24 hour online access to EMT & Fire Training Inc. Self Paced Learning Management System. Internet connection problems. We understand that issues may arise with connectivity or software during the instructor led lectures in the virtual classroom. If something unforeseen interferes with a students ability to view and or hear the lectures, alternative arrangements can be made to view the lectures in a different format or at a different time.